Just then, Jack discovered a sodden parcel wedged between the plane’s ribs. As a plane prepares to ferry Dutch refugees out of Java to escape war-torn Java, the captain is passed a valuable package to carry to safety. But the plane is attacked, and crash-lands, the passage temporarily forgotten in the quest for survival. When Jack Palmer, a sailor and beachcomber, comes across the abandoned wreck of the plane he can’t help but be curious about what he might find on board. What he does find is beyond anything he could imagine. Diamond Jack, the first title in the new History Mysteries series by Mark Greenwood, is a junior novel exploring the events surrounding the crash of a Dakota aircraft and subsequent disappearance of a parcel of diamond on board. Using the known facts and people involved, interwoven with a fictionalised version of what might have happen, the story provides an intriguing glimpse into the past. Young readers will be drawn into the mystery as they also view and learn about a chapter of Australian war history. With historical photographs, maps and notes including a timeline, this is history children can connect with. One day he showed them a cricket bat and ball. ‘Wanna play a game?’ he asked. Sundown and Tiger were willing and Mosquito said he’d give it a go. When Aboriginal stockman Johnny Mullagh throws a ball back to the settlers playing a game of cricket, they invite him to join in. Soon Johnny, whose real name is Unaarrimin, is a skilled cricketer, spreading the game amongst his friends. When the team is invited to tour England, they are keen, but the Board for Protection of Aborigines says they can’t go. So Johnny and his friends sneak out of the country and head to England to take on the best, and delight crowds with their cricket prowess and their displays of boomerangs, spears and dance. Boomerang and Bat tells the story of the real first eleven, the first Australian touring team. Greenwood’s text is informative but at the same time captures the emotion of the story, and Denton’s ink and watercolour illustrations bring both landscape and characters to life, capturing the times with detail which young readers will enjoy exploring. the drums of a distant war are beating. Guy and Midnight heed the nation’s call. The wind blows in Midnight’s mane. And they ride to join the Light Horse. Guy Haydon has loved his horse, Midnight, since she was born on the family farm. Now he and Midnight are joining up – heading off to fight together in a war on the other side of the world. Together they travel to Cairo and, in spite of being separated when Guy is sent alone to Gallipoli, they later ride together on one of the last great cavalry charges in history, the ride on Beersheba in August 1917. 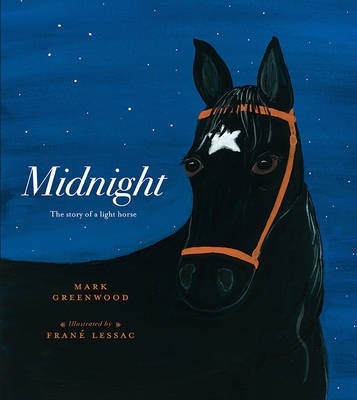 Midnight: The Story of a Light Horse is a stunning new picture book from one of Australia’s leading creative pairings in the form. The text is a wonderful blend of poetic, emotive prose and historical basis, and the illustrations capture the colours of the desert and bush settings and the starkness of he war scenes with a deceptive simplicity. Back of book notes give context to the true story on which the book is based, including details of the charge on Beersheba. With ANZAC Day approaching, Midnight: The Story of a Light Horse is ideal for school use as well as private reading. Youngsters will enjoy de Rougemont’s tall tales, and the journey on which they take him, from poverty to fame and back again. A member of the Royal Geographical Society revealed himself. “Is everything you say true?” he asked. Louis smiled serenely. “Every word,” he replied without hesitation. Louis de Rougemont is an explorer. He has written a book telling of his travels – travels so breathtaking amazing people queue up to come and hear him speak. There’s the story of riding a giant turtle, the one about wrestling a crocodile, and even one about finding giant nuggets of gold. Everywhere he goes Louis is feted and applauded. Until newspapers reveal him to be a charlatan – possibly the greatest liar on earth. The Greatest Liar on Earth is wonderful historic fiction, telling the “true” story of a man who made his name by telling lies. Youngsters will enjoy de Rougemont’s tall tales, and the journey on which they take him, from poverty to fame and back again. Back of book facts show the truth on which some of his stories were based, and the illustrations bring to life both the rich tapestry of Victorian London and the exotic settings of the fraudster’s “adventures”. The team of author Mark Greenwood and artist Frane Lessac have a knack for bringing history to life in a way sure to engage young readers, who will be intrigued with the character and his story at the same time they are learning about the past, and receiving a gentle lesson about the consequences of not telling the truth. This book is avaialble from good bookstores, or online from Fishpond. As a child, Ned Kelly saved another boy from drowning in a flooded creek, and was awarded a green sash for his heroism. But it was not this act of bravery for which Ned was to become famous – but for his career as an outlaw, begun just a few short years later. Whilst there are have been dozens of books, stories, songs and poems about Ned Kelly’s life, Ned Kelly and the Green Sash offers a new insight into his childhood and into his character. The first person narrative presents Ned’s perspective of events, whilst the use of newspaper formats in the middle of the book offers the contrast of the opinions of the time. The gouache illustrations, by Frane Lessac, also give readers an insight into Kelly’s life, with the rich colours of the bush contrasting with the more subdued tones of the prison cell and the sepia tones of the newspaper spreads. Author Mark Greenwood encourages readers to form their own opinions of Kelly’s actions, and the first person narrative, complemented with the news extracts and Ned’s own writing, as well as back of book notes, gives plenty of food for thought. A wonderful offering for children of all ages. This book can be purchased online from Fishpond. Buying through these links supports Aussiereviews. In time for ANZAC Day 2008, Walker Books Australia have released a very Australian picture book telling the well known story of Simpson and his donkey. Born in England, Simpson was far from home in Australia when World War 1 broke out. He enlisted and found himself not in England, as he’d hoped, but in Egypt and then Turkey, where he worked as a stretcher bearer. In Gallipoli, Simpson found stretchers in short demand, so he enlisted the help of wild donkeys to rescue over 300 wounded men and to transport water to thirsty soldiers. Sadly, as Simpson went once more onto the battlefield he was shot and killed. This retelling of Simpson’s story is told in simple language but not at the risk of trivialising the story or the war itself. Greenwood has a knack of making history accessible for children. In turn, illustrator Frane Lessac, brings the story to life with gouache illustrations filled with little details and rich colours. This is an important story beautifully represented in a form suitable for educational use and also private reading. In 1887 seventeen year old Harold Lasseter, searching for adventure and fortune, stumbled on a gold reef which would consume him for the rest of his days. Having drawn himself a map of the reef’s location, Lasseter was forced by need for food and water to leave the reef. Although he visited it a second time, the difficulties of mapping and access of such a remote area meant that it was 30 years before he could get the backing needed for a large expedition to recover the gold. Unfortunately, that expeditionwas doomed and Lasseter died in the Outback. No other person has ever managed to lcoate the reef. The Legend of Lasseter’s Reef is the first picture book to be written about Lasseter and his quest. Author Mark Greenwood uses a combination of historical recount, diary extracts, photographs and maps to impart the story and to lend an air of the mystery surrounding Lasseter’s reef. An excellent read for the young historian or adventure fan, as well as an outstanding classroom or library resource. One of the more colourful characters from Western Australia’s past has been brought to life in a new picture book from Cygnet Books, the children’s imprint of UWA Press. The Legend of Moondyne Joe tells the story of Joseph Johns (who became known as Moondyne Joe), who is remembered for his daring escapes from custody. History has questioned whether Joe was really a hardened criminal, or simply a harmless lover of freedom. Author Mark Greenwood manages to explore Moondyne’s tale without either condemning or condoning his actions, yet the reader finds himself quietly cheering Joe on. The story is told in simple yet clear detail and is superbly complemented by the gouache paintings of illustrator Frane Lessac (who is also Greenwood’s wife). The illustrations add to the air of history in the piece and are also true to the Western Australian setting. The pictures of the Fremantle Prison are especially accurate. The addition of a glossary of terms and notes on the convict era are a useful educational tool and also help the independent reader to access the text. The Legend of Moondyne Joe is an outstanding non fiction picture book text.